This tagline emphasizes the cooperative nature of ObeyGC2 It is the power of working together which makes it so potentially impactful. Not only can we work together with others in the church, but also, when agendas coincide, we can work with public (government) and private (NGO, business, parachurch) enterprise in a show of support for values we share. I’ve addressed the issue of cooperative effort within the church in previous entries. Now I’d like to propose some guidelines for cooperative effort outside the church. ObeyGC2 does not need to be redefined in order for collaborative efforts to occur. It already provides a framework for collaboration. Often practical quality of life issues are of common interest among public, private and church sectors. The task is to discover where the legitimate concerns of each sector overlap and focus the collaboration on that area of overlap. Each sector has its own unique and God-given area of responsibility and concern and each sector will already recognize many of its own particular distinctive spheres of influence. What must be redefined is the perception of the role and spirit of the church in working with the public and private sectors on common areas of concern. 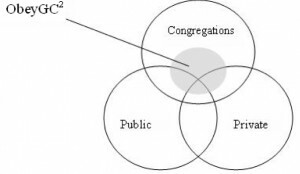 When communicating to congregations (or individual Christians) we need to point out that it is an effectiveness and stewardship matter that they collaborate with public and private sectors whenever it is possible or feasible. This will often mean that congregations must initiate the relationship. This also means that congregations should be responsive to overtures from the private and public sector when appropriate. Ask about felt-need issues felt by the potential partner(s). These issues will often be easiest to collaborate on if they are framed in terms of people or how people are affected. Present the role of the congregation as that of a servant. Jointly discuss possible contributions by each of the current and potential partners, with each party focusing on its own potential areas of contribution. Seek to make the first step an event or project of very limited duration. Follow this up with discussions on possible next steps and/or longer term collaborative efforts. This will provide all parties with a comfortable escape clause and help to identify individuals within each of the partner groups which might be open to ongoing efforts related to the issue. Be careful to do what is right in the eyes of everybody. 18 If it is possible, as far as it depends on you, live at peace with everyone.